Should Jay Z Drop his Collaboration with Barney’s Amid Racial Allegations? Jay Z broke his silence late last night. And released a pretty lengthy statement on the Barney’s controvbelow on his website. Check the statement below. I move and speak based on facts and emotion. I haven’t made any comments because I am waiting on facts and the outcome of a meeting between community leaders and Barneys. Why am I being demonized, denounced and thrown on the cover of a newspaper for not speaking immediately? Jay goes on to write that the only victims in this situation are those that will benefit from his Shawn Carter Foundation. It seems to be the question of the day on Twitter and Facebook. And the only person who can answer it has been surprisingly mum. Actually, it’s not to shocking given an avalanche of angry tweets directed his way and a we-hate-Barneys-petition circulating over 3,000 signatures urging Jay to sign in black/blue or they’ll hate him too. If not already. ….and now we have this situation. While, no doubt Olivia Pope aka Judy Smith is as-I-type-this “getting it handled.” Let’s backtrack. In February, a teenager visited Barneys department store in Midtown Manhattan to snag a $300 Ferragamo belt he’s had his eye on. Whips out his debit card. Purchase complete. End of story. Nope, just the beginning. He leaves the store, walks a few blocks and is accosted by police officers that take him “downtown,” and according to Trayon Christian have him wait two hours before his story of legitimately buying the belt checks out. Rewind to two months ago when 21-year old Kayla Phillips visited the same Barneys Trayon will eventually go to. She purchased a $2,000 Cèline bag. Once again, she makes the purchase and leaves. When she gets to the train station four police officers pepper her with questions, look at her store receipts and ask how could she afford this bag? Both Trayon and Kayla have pressed charges against Barneys and NYC police department. Barneys CEO released a statement on Facebook yesterday. Barneys New York believes that no customer should have the unacceptable experience described in recent media reports, and we offer our sincere regret and deepest apologies. Further to our statement of yesterday, we want to reinforce that Barneys New York has zero tolerance for any form of discrimination. We are a strong proponent of equal rights and equal treatment for all human beings. Our mission is to ensure that all customers receive the highest-quality service—without exception. How does Jay add to the mix? Jay Z has plans to release clothing and jewelry lines called “A New York Holiday” with Barneys in November and help decorate their holiday windows in December. The items Jay has produced range from $70 to $33,000, according to the New York Daily News. And 25 percent of the money from the line will go towards his Shawn Carter Foundation charity that provides minorities college scholarships. As enriching as it all sounds–especially the relationship to his charity– I’m still on the fence about Jay dropping the deal. Because and I quote “I’m not a businessman, I’m a business, man.” And as such, Jay looks at the bottom line. Always. Not that integrity isn’t part of his makeup. This showcases it. Yet, this issue pales in comparison to spilled champagne. It’s one that even Oprah struggles with. Even still, I seriously doubt two cases of racial discrimination will discourage this millionaire’s club deal. Although I wish it would. It would set a sterling example for his young fans about standing up and walking away instead of chasing the money. As well as his daughter, who some write could easily be Kayla Phillips in 10 or 20 years. Sometimes NYC makes me ill "@questlove: guess where i won't be christmas shopping for mom this year. 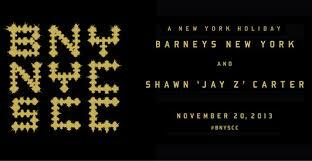 http://t.co/SJXjkeznJs #shame #Barneys"
What do you guys think will Jay pull a Dave Chappelle and run away from the money or stand up and walk away? Do you think he should continue the deal to benefit his Shawn Carter Foundation?